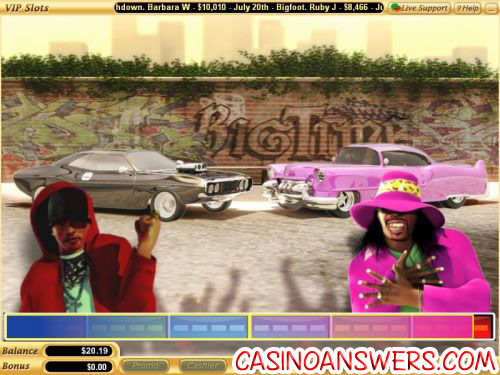 Big Time Video Slot Guide & Review - Casino Answers! 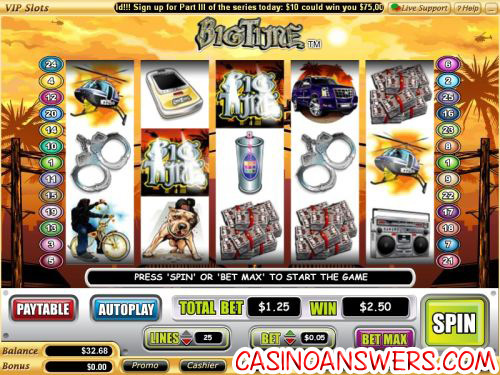 Big Time is a 5-reel, 25-line video slot developed by Vegas Tech, featuring a wild substitute symbol, scatter wins, multipliers, free spins and a bonus game. You can play Big Time at US-friendly online casinos VIP Slots Casino and Go Casino. Bets on the Big Time slot game are $0.01, $0.05, $0.10, $0.25, $0.50, $1, $5 and $10 per line. Use the arrows next to “Lines” to set up to 25 line active or hit “Bet Max” to play all 25 lines. The lowest total bet you can make on the Big Time video slot is a penny per spin all the way up to the highest total bet of $250 per spin. Big Time is great for low or high stakes slots players. To play the Big Time slot machine, hit the “Spin” button once you’ve made your bet. The Homie symbol is the top paying symbol in Big Time. It will pays a sweet 10,000 coins if you hit 5 of them on an active payline. The Homie symbol is wild and will substitute for all symbols except for the Scattered Big Time logo symbol. When the Homie symbol participates in a winning combination, your prize will be doubled. Other substantial symbols include the Girl at 2000 coins and the Ride at 1000 coins. The Big Time logo is the scatter symbol on the Big Time video slot. It will pay out 2X total bet for two symbols, 5X for 3, 15X for 4 and 150X for 5 Big Time scatter symbols. When three or more Big Time logos appear anywhere on the reels of Big Time, you will trigger the Bounce Off bonus game. In the Big Time bonus game, you will get to pimp your ride by choosing your colour, wheels, hood and mirror style. Each one will give you a different number of free spins. Next, you will compete in a Bounce Off where you can win a greater multiplier by winning the Bounce Off or receive a consolation prize if you lose. The free spins feature can be re-triggered with the same number of free games as the original trigger. Free spins are played at the lines and bet of the triggering game. Bounce Off bonus wins are added to payline and scatter wins. Hit “Autoplay” to open up the autoplay mode on Big Time. You can set the number of spins (up to 500), the number of seconds between spins, to stop when the jackpot is won, stop if a win exceeds or equals (from $50 to $250), stop on any win and stop if credits are increased or decreased by (from $50 to $250). You can stop autoplay at any time by hitting the “Cancel Autoplay” button. Payouts are made according to the Paytable. Payline wins are multiplied by the bet per line. Scatter prizes are multiplied by the total bet. Scatter wins are added to payline wins. Only the highest win on a selected payline will be paid out. Coinciding wins on different paylines are added. All symbols pay left to right, except for the scatter symbol (which pays any). The wild symbol substitutes for all symbols except for the scatter symbol. The prize is doubled when the wild symbol substitutes in a winning combination. To see how much street cred you really have, you can play Big Time at VIP Slots Casino and get a $777 signup bonus! Are players from the United States able to play Big Time for real cash? Yes, you can play Big Time if you are located in the United States of America by signing up at a Vegas Tech casino such as VIP Slots Casino or Go Casino and making a deposit. Is there a Flash game of Big Time I can play for free? At the time of this writing, a Flash game of Big Time is not available quite yet due to the fact that the game was only recently released. However, keep checking back at VIP Slots Flash Casino or Go Flash Casino and it may be added by time you check.